Recollections. Reflections. And a few rants. 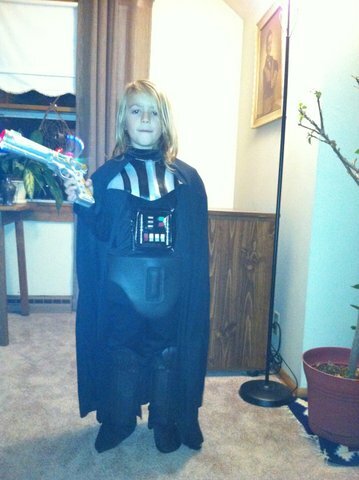 My grandson Ezie is very serious about being Darth Vader, the latest in a string of evil personas he’s adopted. He brought two red light “savers” and his “Dark” Vader mask/helmet with him on our annual New Years vacation to San Diego. Character assignments were made. I was Queen Amidala. His Dad was Han Solo. His brother was Luke. Grandpa was Jabba the Hut. Battle after battle was staged. When I tried to tear him away from the Star Wars marathon on Spike TV to go out and enjoy the sunshine, he crossed his light “savers” across my neck to behead me. He might think of himself as Dark Vader but he looks more like pig pen. I swear small tornadoes of dust follow him. He insists on wearing his blond hair past his shoulders and it’s always in his eyes and snarled in spots with cyclones of something sticky. He usually has snot streaked across his face. He won’t wear anything but sweat pants that are too big so that the bottoms are always filthy and frayed. Paired with his favorite grey on grey striped sweat shirt he looks like a small prison inmate. Pig pen and I were going through security together on our way home. “I’ll have to check this young person,” the agent said. “Is this a boy or a girl?” Seriously, I thought. Who would make this slob out for a girl? Ezie rolled his eyes. He hates being mistaken for a girl. I looked around to make sure no one heard him say this. You’re not supposed to joke about these things. “I guess they know you’re on the dark side,” I replied. That made perfect sense to him. His dad went with him over to a designated area where the TSA agent swiped his hands with something. “Yes, I’m sure that they know,” he said. “Well, I just joined recently,” said Grandpa. “Oh,” said Ez and he settled down with his Star Wars phonics book for the long flight. We weren’t home for more than 24 hours when Ezie and Noah’s mother, Angela, called to let us know that Ez has already informed her about his Christmas list for 2014, just shy of 12 months away. “He wants two robot legs and a robot arm like Darth Vader,” she said. He’s all set for Congress. These are the stories from my breezeway. That enclosed space between the garage and the house where guests gather and stories are told. This blog is about my life and times as a native Milwaukeean—growing up in the 60s, coming of age in the 70s, raising kids, working, reflecting, enjoying grand kids and life. I thought about calling this Blog “My Crotch Hurts From Sitting on the Fence” because I do literally feel that I’ve often been on the fence—afraid to put my whole self out there. Always holding my passions back a little. Heck, when I was a kid, I had two career aspirations—nun or exotic dancer. So here it comes, my whole self, nun and exotic dancer all rolled into one.